Tea is the most-consumed beverage worldwide next to water. For some 5,000 years, people have been getting a lift from brewing tea leaves. But it's only been in the last three decades that researchers have immersed themselves in the science behind tea's purported health benefits. Several ARS scientists at various laboratories are studying the bioactivity of tea compounds. Some have studied the relationship between tea and metabolism, and some have looked at the effect of tea on blood glucose and cholesterol levels. Others are studying tea's impact on the ability of the body's cells to handle oxidative stress. And some are looking at the effect of green tea on slowing development of abnormal blood vessels in lab mice. In certain diseases, including cancer, angiogenesis—growth of new blood vessels—becomes excessive. These new vessels not only provide nourishment to tumors, but they also serve as portals through which tumor cells can escape into the body's circulatory system and spread to other organs. Compounds found to be anti-angiogenic may prove therapeutic by "starving" the tumors. The age-old Camellia sinensis plant is the source of all nonherbal teas. Manufacturers process C. sinensis leaves three different ways to produce the three major classes of teas known as green, black, and oolong. Today, about 75 percent of the tea produced worldwide is black; about 23 percent is green; and about 2 percent is oolong. (K10695-2) Consider that coffee beans are green before roasting turns them brown and ready for market. Tea leaves are also green at harvest. To achieve a variety of taste profiles, manufacturers carefully control whether, and for how long, tea leaves are exposed to air, a process called fermentation. When fermentation is completely arrested, the tea stays "green" or yellowish brown. When fermentation time is long, the leaves darken and become "black" tea. Somewhere in between these two extremes, "oolong" tea is created. Over the centuries, as C. sinensis plants grew in the sun, they protected themselves against photosynthetic stressors by forming chemicals known as polyphenols. This group of beneficial compounds includes flavonoids—the same class of compounds that give many fruits and vegetables their antioxidant boost. It is perhaps because of tea's high antioxidant activity that tea research is taking such a variety of turns. Physiologist William Rumpler is investigating the ancient Chinese belief that oolong tea is effective in controlling body weight. 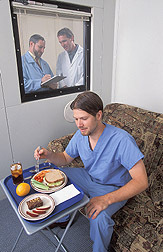 Rumpler is with ARS' Diet and Human Performance Laboratory (DHPL), one of seven laboratories that make up the Beltsville Human Nutrition Research Center (BHNRC), Beltsville, Maryland. To measure how tea influences energy expenditure (EE), Rumpler and colleagues gave each of 12 male volunteers 4 separate beverage formulas for 3 consecutive days. Before the study, the volunteers refrained from consuming caffeine and had their 24-hour EE measured. EE was measured again on the third day of each formula treatment. The treatments consisted of full-strength tea, colored water with caffeine equal to full-strength tea, half-strength tea, and colored water. The results showed that the EE of volunteers was about 3 percent higher after they drank either the caffeinated water or the full-strength tea than after they drank the colored water. On average, the volunteers burned an additional 67 calories a day when they drank tea instead of an equal amount of water. Perhaps most interesting was that fat oxidation was a significant 12 percent higher after the full-strength tea treatment than after the water treatment. "Our data suggested that a component of tea other than caffeine might have promoted preferential use of fat as an energy source," says Beverly Clevidence, a study coauthor and head of the DHPL. "But the information is tentative, and we need more studies to confirm it," she adds. to measure how tea influences metabolism and energy expenditure. It is universally accepted that caffeinated tea raises metabolic rate because caffeine is a stimulant. "The interesting part of our study, which agreed with findings from a similar study in England, was that when you drink tea you turn on the fat-burning spigot a little bit more than when you drink caffeinated water," says Rumpler. Some scientists speculate that caffeine and EGCG—a highly active catechin in tea—may act together to increase fat oxidation. "Anecdotal evidence over time, particularly in China, points to a relationship between green tea consumption and weight loss," says Rumpler. "But until we do a really comprehensive study in which we have humans drink tea and see whether they lose weight, we can't actually say that green tea makes people lose weight. What we can say is that it raises metabolic rates and increases fat oxidation rates. Those are two things that are predictive of weight loss." 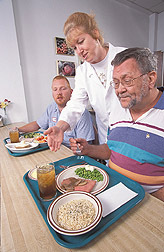 In September 2002, ARS and other researchers met at the U.S. Department of Agriculture in Washington, D.C., for the Third International Scientific Symposium on Tea and Human Health. The symposium was hosted by organizer Jeffrey B. Blumberg, associate director of the Jean Mayer USDA Human Nutrition Research Center on Aging at Tufts University in Boston, Massachusetts. Blumberg is also director of HNRCA's Antioxidants Research Laboratory. 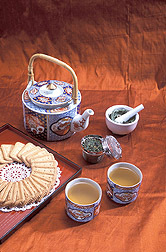 One issue discussed there was inconsistency among early studies of tea. "Confounding"—a situation in which findings are affected by a variety of uncontrolled factors—can occur. "Some studies are simply not sensitive enough to eliminate confounding factors," says ARS chemist Joseph T. Judd, who is with DHPL. In the case of tea studies, it could be as simple as a volunteer's getting the same flavonoids that are in tea from other foods consumed during the study. Blumberg notes that flavonoid concentrations differ in tea beverages, depending on whether the preparation was blended, decaffeinated, brewed, or iced. Milk protein, for example, when added to tea, had previously been reported to possibly bind to, and therefore reduce, the flavonoid concentrations. "There has been only one study that showed that adding milk decreased the bioavailability of catechins in tea," says Blumberg. "Those results were not replicated in any of several subsequent studies." Many factors can affect the way tea compounds are absorbed, metabolized, and excreted, according to Blumberg. Judd, who is with the DHPL, is the lead author of a recent study that found that drinking tea lowered cholesterol and, therefore, could possibly reduce the risk of coronary heart disease (CHD). 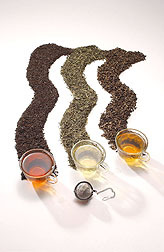 Judd points out that while several epidemiological studies found that green and black tea consumption is associated with reduced risk of CHD, experimental studies had not confirmed this. "The experimental studies did not control the background diet of the volunteers," says Judd. "Other foods or nutrients consumed during the studies could very well have affected the risk factors." Judd's recent study assessed the effects of black tea consumption on blood lipid and lipoprotein concentrations in adults with mildly high cholesterol. He carefully controlled the volunteers' diet and weight. Seven men and eight women were given five servings of black tea a day for 3 weeks and a tea-flavored water for another 3-week period. In a third study period, caffeine was added to the tea-flavored water in an amount similar to that found in the tea. "Overall, we found a 6 to 10 percent lowering of blood lipids in drinkers of black tea in just 3 weeks," says Judd. What's more, the study showed no effect on high-density lipoprotein, or "good," cholesterol. The study's authors concluded that drinking black tea—along with following a prudent diet moderately low in fat, cholesterol, and saturated fatty acids—reduces total and LDL cholesterol by significant amounts and may, therefore, reduce the risk of CHD. The study is slated to appear in an upcoming issue of the Journal of Nutrition that will feature the tea symposium proceedings and an introduction by Blumberg. Judd is now conducting a study on the antioxidant effects of tea phytonutrients on smokers. ARS chemist Richard Anderson found that regularly brewed tea, when added to the fat cells of laboratory rats, increased insulin activity by more than 15 times. 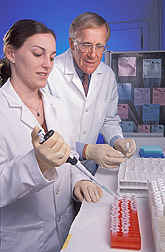 Anderson is with the BHNRC's Nutrient Requirements and Functions Laboratory. He noted that this increased insulin activity was found with green, black, and oolong teas, regardless of whether caffeinated or decaffeinated. Further, his research showed that in green and oolong teas, the catechin EGCG was largely responsible for the results. In black tea, active ingredients included tannins and theaflavins, in addition to EGCG. "The amount we tested was comparatively very small, considering the effect we observed," says Anderson. Confirmational studies in humans are required before the results can be applied to people. Ernst J. Schaefer, director of the HNRCA's Lipid Metabolism Laboratory, recently completed a pilot study during which 8 volunteers with type II diabetes had lower blood sugar levels by 15 to 20 percent after drinking 6 cups of tea per day for 8 weeks. Schaefer and Blumberg have since launched a 24-week, randomized, double-blind study involving 40 male and female volunteers with type II diabetes, not taking insulin. "We want to examine the effect that green and black teas have on the glucose levels of the volunteers," says Schaefer. Since nearly 95 percent of tea's polyphenol compounds are flavonoids, tea ranks among plants with the highest total flavonoid content. Green tea contains more simple flavonoids, called catechins, while black tea contains more complex varieties, called thearubigins and theaflavins. Some polyphenols have recently been determined—in test tube studies—to be more potent antioxidants than the well-known vitamins A, C, and E. But results from such test tube, or in vitro, tests cannot be applied to humans because they do not account for factors such as bioavailability, metabolism, and excretion, says Blumberg. "We know that these flavonoids are not as bioavailable as vitamin C on a per-milligram basis," says Paul E. Milbury, a scientist with the Boston HNRCA's Antioxidants Research Laboratory. Still, one 6-ounce cup (about 173 grams) of green tea has about 235 milligrams of catechins, whereas a medium-large (178 grams) apple has 16 milligrams of catechins and 10 milligrams of vitamin C. This data is available from the BHNRC's Flavonoid and National Nutrient databases. Up to 90 percent of tea consumed in the United States is black. But green tea consumption has more than doubled recently. "Over the last 4 years, green tea consumption increased tremendously, going from 3 to 4 percent of total tea consumed in the United States to about 9 percent today," says Joe Simrany, president of the New York City-based Tea Council of the U.S.A. Simrany says the council is seeking a standardized system for measuring and labeling commercial teas' antioxidants. Blumberg says consuming a variety of tea types and preparations adds nutritional benefits to the diet. "The beauty of tea is that it can be enjoyed in so many ways, depending on individual tastes and preferences," he says. "My hope is that future studies will be designed to accurately assess tea's polyphenol levels and to measure tea's role in lowering the risk of chronic diseases. "—By Rosalie Marion Bliss, Agricultural Research Service Information Staff. To reach scientists mentioned in this article, contact Rosalie Bliss, USDA-ARS Information Staff, 5601 Sunnyside Ave., Beltsville, MD 20705-5129; phone (301) 504-4318, fax (301) 504-1641. "Brewing Up the Latest Tea Research" was published in the September 2003 issue of Agricultural Research magazine.